Soaring impressively above the Nile River, the luxury Conrad Cairo offers elegant and some of the largest guestrooms with panoramic views of the Nile, private balconies and spacious bathrooms with separate showers. Located downtown along the corniche, the hotel lies in close proximity to Cairo's main tourist attractions. Voted "Best Downtown Hotel in Cairo" (Egyptian Ministry of Tourism, 2005), the Conrad Cairo is the city's first choice for dining and entertainment, featuring International, Italian and Seafood specialties. The hotel's facilities further include a heated outdoor swimming pool, a fully equipped health club and a world class casino. The Conrad Cairo luxury hotel features a heated swimming pool with a view of the Nile River, a helipad, a world-class casino, business centre, five executive levels, an executive lounge and shopping arcade. Wireless high-speed internet service is also available throughout the hotel. 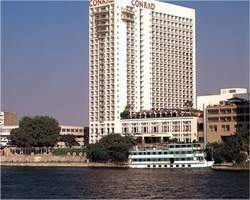 The Conrad is close to downtown Cairo, as well as many local business and leisure destinations in Egypt. The Conrad Cairo offers Meet & Assist service at the airport for guests arriving in Egypt, in order to assist travelers with visas and luggage, to expedite customs procedures and facilitate a smooth entry into Egypt. Limo transfers to the hotel are also available, if requested at the time of booking. The Conrad Cairo's 617 spacious guestrooms and suites all offer private balconies and stunning views of the River Nile, as well as satellite TV, electronic locks, the latest data communication facilities, including wired and wireless high-speed Internet access, and marble bathrooms with separate bath and shower. The Conrad Cairo's Deluxe rooms feature one king-size bed, bathroom and private balcony with views of the city or the Nile. The Conrad Cairo's Deluxe rooms feature two queen-size beds, bathroom and private balcony. The Conrad Cairo's Accessible guestrooms feature two single beds, a specially equipped bathroom and a private balcony. The Conrad Cairo's Executive guestrooms feature one king-size bed, special furnishings, bathroom, balcony and high ceilings. Executive guests enjoy unlimited access to the hotel's Executive Lounge. The Conrad Cairo's Executive guestrooms enjoy spectacular Nile views from the hotel's upper floors, as well as high ceilings, two single or queen-size beds, special furnishings, bathroom and a private balcony. Executive hotel room guests enjoy unlimited access to the hotel's Executive Lounge. The Conrad Cairo offers a wide selection of dining experiences, from authentic Egyptian and Oriental specialities to all-day buffet and à-la-carte cuisine. The Hot & Blue disco and nightclub at Conrad Cairo hotel opens seasonally. The Conrad Cairo offers 11 versatile banquet and meeting rooms totalling over 3,500 square metres (37,600 square feet) of function space for meetings and events ranging from board meetings for 12 delegates to gala receptions for up to 1,200 guests. The Conrad Cairo's four fully functional meeting rooms offer extensive and adaptable meeting spaces where functionality and the support of our dedicated team are coupled with luxury. The four boardrooms are perfect for executive meetings, private lunches and dinners. Set in a modern executive ambience, they provide a peaceful and comfortable atmosphere with panoramic large windows offering natural daylight. The media wall, hidden behind two wooden panel doors, is perfect for presentations. Luxury and style await you in the Conrad Ballroom. The décor presents a subtle yet luxurious marriage of modern elegance with the ancient oriental world of Egypt, making it ideal for conferences, business meetings and exhibitions. The Conrad Ballroom measures 882 square metres and can accommodate up to 1200 guests, either in one large room or divided into three separate spaces. The Nile Ballroom seamlessly blends hi-tech equipment with sophisticated finesse, and is designed to host smaller meetings in an atmosphere of chic and classical elegance. The dark wood, mirrors and fabric wall panelling provide subtlety, while silk drapes and carpets bring a touch of the Orient to the room's décor. Directly facing the main hotel entrance and equipped with top-quality conference facilities, the Nile Ballroom is the optimum choice for elite and prestigious Cairo meetings for up to 300 guests. The Salon Diplomat is designed as a multi-purpose function room with an internal layout that can be altered to create the right atmosphere for every event. Its sober décor lends itself to any type of event, including receptions, meetings, seminars and small conferences, and it boasts a useful built-in stage, a separate entrance and a dedicated kitchen. The Conrad Cairo's 24-hour Health Club features a fully equipped gym, aerobics studio, sauna, and a steam and massage room with Thai massage. Outdoor heated adult and children's swimming pools overlooking the Nile are also available.